Insects that cannibalize often do so to boost their nutrition, but a new study of Colorado potato beetles suggests another reason for the behavior: to lay low from predators. 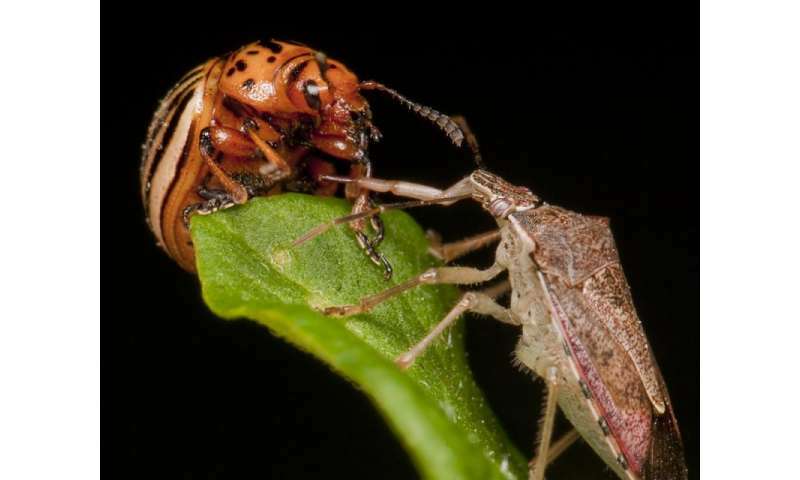 The study, published in the April issue of Ecology Letters, reports that a Colorado potato beetle mother lays extra unfertilized eggs when she senses threats from stink bug predators, which eat beetle larvae but are rarely successful at killing adults. Upon hatching, the larvae eat the extra eggs, giving them ample nutrition to grow quickly while avoiding foraging on leaves, where they create vibrations and become targets for stink bugs. The results are a step toward finding natural controls for Colorado potato beetles, as identifying the predator's chemical cues could lead to less plant damage and smaller populations of potato beetles. "We are trying to identify how the beetles detect their predators," said Jennifer Thaler, professor of ecology and evolutionary biology and entomology and the paper's senior author. Natasha Tigreros, a postdoctoral associate in Thaler's lab, is the paper's first author. "We think the beetles might be detecting volatile organic compounds from the predators," Thaler said, "and we would like to investigate whether these volatiles can be manipulated to trick prey into thinking predators are around and reduce their feeding and oviposition. We are beginning to try this in agricultural fields." Colorado potato beetle larvae are known egg cannibals. By laying extra unfertilized eggs, mothers provide their offspring with a highly nutritious first meal, though more study is needed to understand how mothers perceive predators and how they control fertilizing some eggs and not others, Tigreros said. While this strategy reduces the number of offspring, it helps ensure survival of hatched larvae. When the larvae perceive the predator, they hide and forage less, so they are not detected. At the same time, an initial egg meal allows the larvae to grow quickly into adulthood, reducing the amount of time when they are vulnerable as prey. "Feeding on the eggs allows them to reduce feeding on leaves without having to pay a cost," said Tigreros. "They are made to have better chances to survive in a world of predators." The study also reveals that the presence of predators can have a big effect on how much damage plants receive, as mothers lay fewer viable eggs, and larvae may eat less and stay in the voracious larval stage for a shorter period of time, Thaler said. "The effect of the predator on the plant can be strong," she said. Colorado potato beetles are a major pest of potatoes and other plants, in part because they are adept at developing resistance to pesticides that are used against them. Stink bugs have not been used to control adults because the adult beetles are rarely eaten. This study shows that even attempted attacks by a predator on adults can affect adult egg production and offspring cannibalism, Thaler said. "In agriculture, our goal is to reduce plant damage, so this is another way to achieve that," she said. The study was done in the lab, where cannibalism was manipulated by placing an egg late in development next to one early in development, so the larvae could eat an egg upon hatching. Other viable eggs were placed by themselves, without an egg meal. Also, stink bug predators feed on larvae through a syringe-like mouthpart. This syringe was cut, creating a sham predator that created a threat but couldn't actually feed on the larvae.